Brian and I were recently invited by Blackboard to host a webinar on the Teaching Approaches menu that was created here at SHU. The session took place today and a recording is available online. During the session, we stated that we are happy to share the resources for other institutions to use and adapt to their own contexts and links to the relevant files can be found in this post. The Teaching Approaches menu – the main resource, reflecting practice at SHU and providing a focus for people to investigate alternative practice. 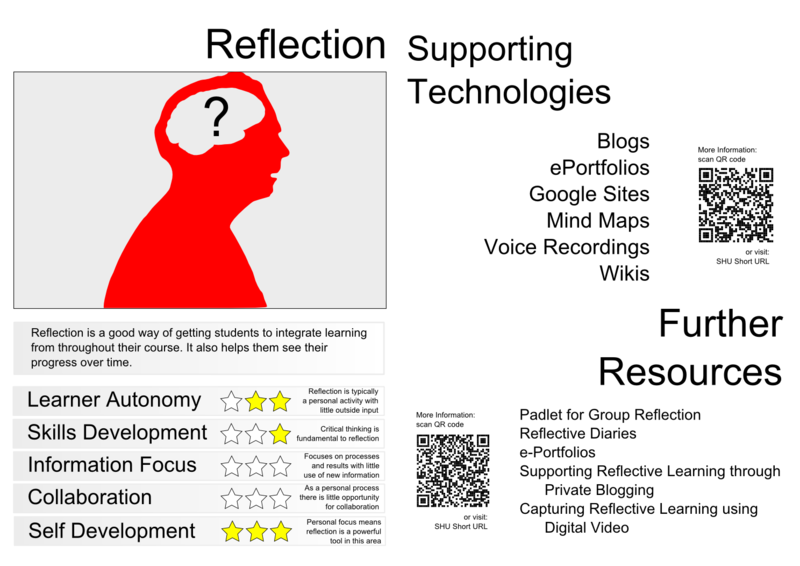 Reflective Action Plan worksheet – for use in workshops as a way to encourage reflection on existing practice, identify potential over-reliance on specific teaching approaches and technologies or modules where there are too many approaches or tools being used. Builds toward an action plan for investigating and implementing identified changes. Scenarios and Approach Descriptions – used in open workshops to ensure that the initial discussion between staff from disciplines is something to which all can relate and comment upon. Envelopes are filled with three each of the approach descriptions and a scenario is stuck to the front, the groups then take an envelope and discuss how each of the approaches inside it could be used to address the scenario. 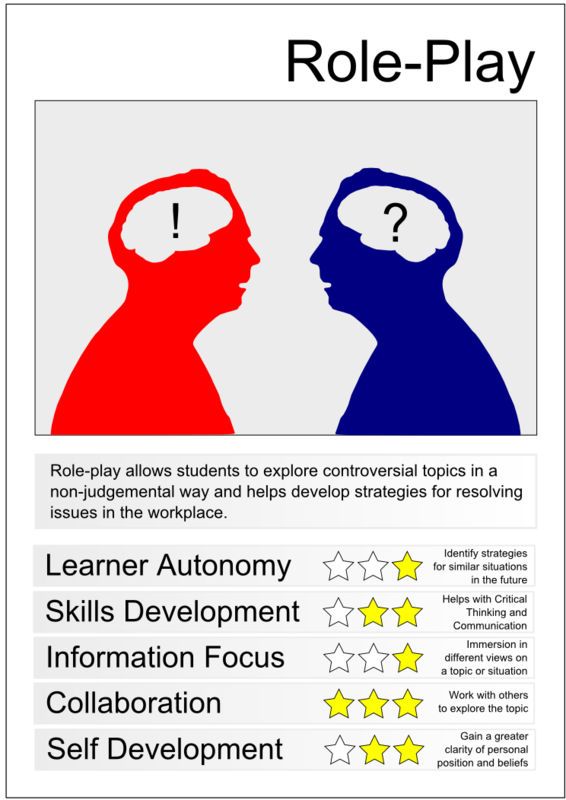 This activity aims to encourage discussion and sharing of practice and is not about finding the ‘right’ answer. Card Sort – mainly used in workshops for a whole course team, subject group, etc. The cards are used to prompt discussion by having participants categorise and cluster each of them – suggested categories include ‘Core’, ‘Aspirational’, ‘Student Expectation, etc. though we usually allow each group to come up with their own. The cards help focus discussion and can be used to challenge assumptions and identify areas that may need to be looked at in more detail. The cards are colour coded, so at-a-glance we can see if a particular approach looks suited to the group. The back of the cards feature the technologies from the menu, so we can look across the clusters and see if there are any technologies that are coming up repeatedly that could be investigated further. The cards are currently a work-in-progress and still need some work to refine and tidy up. 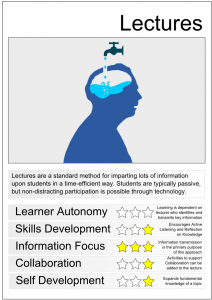 Draft Top Trumps cards – we also drafted some Top Trumps-style cards for some of the teaching approaches. We haven’t taken them further due to the complexity in ranking each approach according to the ‘fight’ statistics. The idea would have been that people could play the game and take away their ‘winning’ card as a prompt to investigate the approach later. 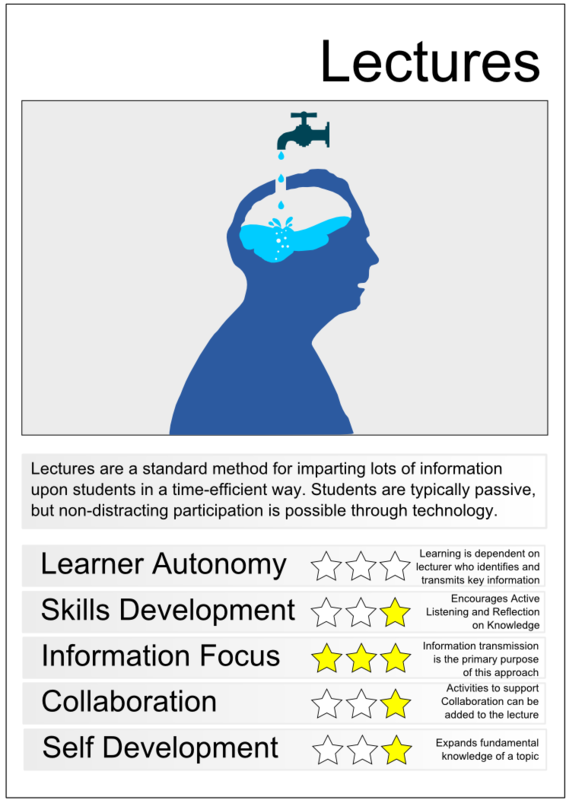 We created (semi-serious) drafts of a full example for ‘Reflection‘ and the front designs for ‘Role Play‘ and ‘Lectures‘. Though only the menu currently has an explicit Creative Commons licence attached, we are happy for other institutions to use the other resources under the same terms and will be adding the explicit licences shortly. If you do use them, we would love to hear back from you about it.